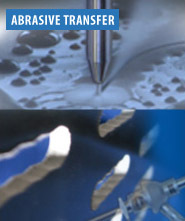 According to Food Production Daily Magazine, “waterjet technology is one of the fastest growing major machine tool processes in the world due to its versatility and ease of operation.” The use of pure water in waterjet cutting systems capable of cutting at incredible speeds up to Mach 3, has received USDA approval for creating a bacteria free hygienic cutting process method. The biggest advantage of waterjet cutting is the time savings using pure water as a food cutting solution. 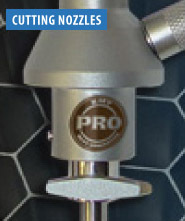 Since no knife blades are ever used, there is no downtime changing out or sharpening dull blades. Bakeries have literally doubled their yield cutting cakes with waterjet compared to using knives. 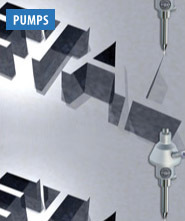 A diamond orifice is used to maximize the waterjet cutting life, typically the size of the stream is a width of a human hair at speeds up to 3,000 feet (914 m) per second. This small kerf width is so thin that food will not be compressed or washed out. 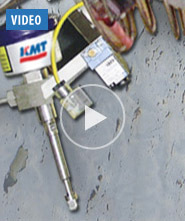 For greater yield, perfect portion control and improved shelf life for food products, KMT Waterjet is the solution. 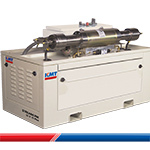 The KMT STREAMLINE® SL-VI 60,000 PSI/4,137 bar pump is also available in a compact 15 horsepower model, uses minimal water consumption and is ideal for food cutting applications.